Are you ready to surrender the things in your life that cause you pain? Can you let go and break out of your comfort zone so that you can heal? It’s not an easy journey, but it can be done.Sometimes we have a vision of the kind of life that we want to have, but first we need to find the courage to let go of what is comfortable and be patient with ourselves as we transform into our full selves. Join Mb Antevasin on Magdalena’s Journey for encouragement, support and inspiration as you grow. In The Birth of Magdalena, readers heard the story about how giving birth to her children woke Mb Antevasin up and set her off on a journey of healing through mothering. After dreaming of this moment for so long, she found that motherhood is messy and challenging, and real. Motherhood is a roller coaster of emotions. You bounce from experiencing the most powerful moments of your life to doing something as ordinary as making sandwiches. 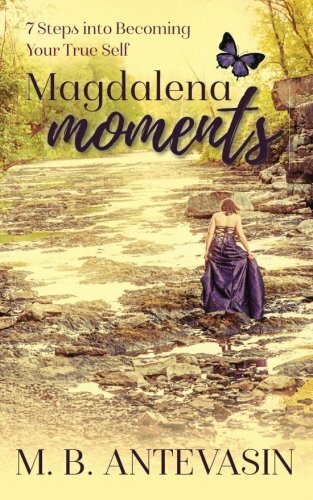 Magdalena’s Journey continues in this second book as Mb Antevasin maps out the seven steps that she has taken towards healing the wounds that manifested after becoming a mother stirred up trauma from earlier in her childhood. With loving acknowledgment and forgiveness she begins to break the cycle of intergenerational family trauma one moment at a time. Readers will learn to map out their own journey and travel through the seven stages of healing and personal development. Pulling from both science and spirituality, Mb Antevasin provides relatable examples from her own busy life and lessons taught in the children’s books that she reads to her little ones at bedtime opening the conversation to all of us about how all of the pieces fit together. Follow her story through the 7 Steps to Becoming Your True Self and let it inspire you to take steps on your own healing journey. Cover photo by Catherine Veltum.